With that premise, the film is really about three characters - the rabbi, the cat, and a Russian guy who shows up a bit later. 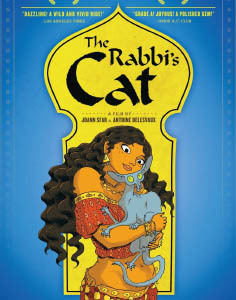 The rabbi and the cat are the focus for the first third of the movie, after which it switches to the rabbi and the Russian, with the cat acting as an occasional narrator. 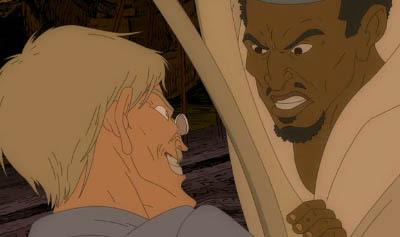 A recurring theme in the movie is religious and racial intolerance, but it's not beating you over the head with a message nor exploring the issue to any great depth; instead, it's something that occasionally manifests, and there are also people in the film who demonstrate the opposite, being very tolerant and open-minded. Furry-wise, the cat's characterization is spot-on. This not a cat talking like a human being, this is a cat talking like a cat (if cats could talk); his personality and motivations are very realistically feline. It's a pity he gets used less towards the end - he even loses his ability to talk for a while - but he regains it, and still has his moments as the film goes on. Other bits of the movie I enjoyed were the rabbi practicing for a stressful test, his cousin's visit, and an eventful road trip across Africa that has a funny cameo appearance from another comic. There are several colorful characters I'd love to mention, but those would be spoilers. Warning: there's a small amount of violent content, and with the level of the conversations, this is definitely not a kid's film! The ending brings partial closure to the road trip, but it also leaves future events open. It's like we, as viewers, just happened to be watching a chunk of the characters' lives, which are going to be moving on without us. Still, it doesn't feel like our time has been wasted, it's just a narrative structure you don't often see in a lot of North American films. I think it's mainly in this film because it was made by combining three issues of the original comic. 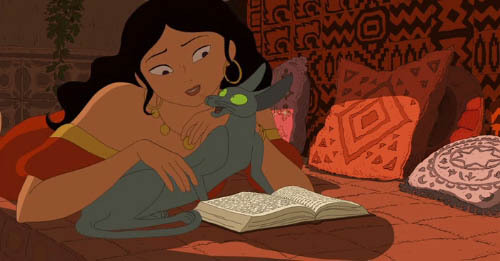 Animation-wise, the whole thing looks good; I much prefer its visuals over that of the comic. Occasionally the animation slips into a simpler, more cartoony look for flashbacks, dreams, and so on. 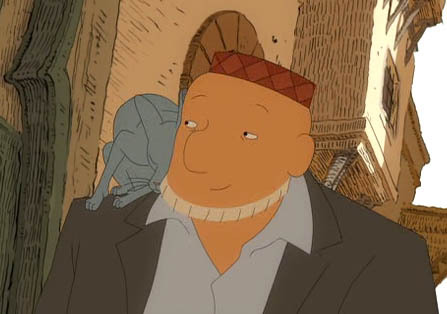 Voice-acting is good, and the music is North African in style with a bit of klezmer mixed in. In any case, if you're a fan of animation and don't mind a slightly atypical narrative structure, I definitely recommend this film, even if its furry angle weakens midway through. Finally, I should mention the English subtitles. There are a couple of versions floating around online – one of which I wrote, with help from friends! If you're downloading a file-shared copy of the movie, the timing of the text changes slightly. The 700M version should use these subtitles (download the .zip), and the 1.1G version should use these. Enjoy! Are you sure that it's set in the 1930s? It's been several months since I saw "The Rabbi's Cat", but I remember it as being set in the 1920s. There was not the political tension that there was in North Africa in the 1930s, and the Russian's escaping from the Revolution by being mailed to Algiers in a crate of books would be more believable in the 1920s when the Revolution was still being consolidated, than in the 1930s when it controlled everything in Russia. Hey, I put a lot of thought into the decade. Looking up other reviews of the comic and the movie mention either the 1920s or the 1930s. Historical events that are mentioned in the movie are the death of Nicholas II (1917), the destruction of Jewish books in Russia under Stalin which started around 1919 - but the film seems to pre-date the establishment of the Jewish Autonomous Oblast in 1934, and is pre-WWII. What really made me prefer a later year was the fact that one of the characters owned the half-track vehicle that had been used to make the Croisière noire, which finished in 1925, and when the vehicle is first shown it's obviously been sitting unused for a long time with cobwebs in a garage, so I thought it fair to add a few years after that - then there's the African guidebook based on the expedition, but I didn't look that up to see if one was actually printed. Also, to a lesser extent, the first printing date of the cameo I mentioned. Regardless, North African political tensions never come up; the characters simply aren't interacting with anything on that level, and the French colonial period between the world wars in Algeria doesn't sound particularly dramatic. Oh, and the anthropologist they encounter is definitely from the old-school anatomist tradition, not from the Neo-darwinian synthesis. And you know what - I'm over-analyzing the date, but at the same time that kind of little nit-pick irritates me, after all the work I put into it. I don't think the original author wanted to pin down the date, or he'd have mentioned it really specifically. The artist wanted that vagueness. After the Stalinist crackdown on Jews in Russia? Definitely. Before WWII? Definitely. Beyond that, who really knows. Like I said, the characters aren't interacting much with larger events going on in the world. What matters to me most of all, at least when subtitles are concerned, is communication. When characters are talking quickly or are using concepts and expressions that would take too long to read in English when a subtitle can only be on the screen for 2.3 seconds, you have to sacrifice literal meaning and go for the spirit of the speech, if not the exact word. 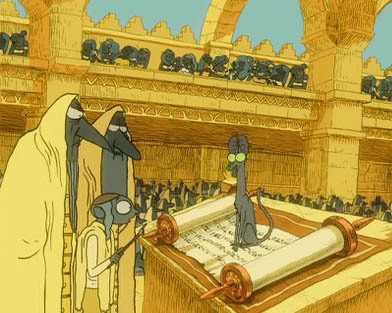 I took words out of the subtitles like 'sanhedrin' because very few people would know what that meant (I certainly didn't), and I replaced it with "Jewish court" because that allows the brain to go with the flow. So I also added a subtitle at the very beginning of the film. As the camera pans across the ships in the port, I stuck in: "Algiers, North Africa, 1930s". Because I assumed a good chunk of the audience wouldn't know the setting offhand. "Algiers? I've heard of... where is Algiers? Oh, North Africa. 1930s. Ok, I get it now." If I'd mentioned 1927 or 1931 or it would have seemed overly important merely by the fact that it was specific. By rounding it off to a decade, it's (A) easier to read, and (B) implies that the general decade is more important, not the specific year. Sure I could have said 1920s, but I decided to round up instead of round down. Letting the audience enjoy the work without needing to wrack their brains over extra, complex details is what ultimately matters. Pedantry doesn't. The description and reviews of the graphic novel on Amazon (sequel) all specify that it is in the 1930s. IMDb disagrees, but it is user-edited and it is not clear where they got their data from. One IMDb reviewer chose the 30s.